who had come to see Sailor perform live. The band was now skippered beautifully by Ollie Marsh, son of Henry Marsh. This was to be quite an enjoyable evening for me on many different levels. This was the first time I've ever seen Sailor live from the audience's point of view. The band and I performed one encore together, which, of course, had to be 'A Glass of Champagne'. This caused quite reaction in the audience because it was a surprise in James' honour. as well as a review of the evening's performance. I was moved by her words because I, too, looked at ships leaving harbors when I was young. Recreating the world of sailors and red light districts was an intensively passionate journey for me . . .
just in case you might alter the perfect memory? That was how it all began with Sailor. Travelling to Bournemouth at age 16 to see Cockney Rebel. And yet to be confronted with my own fantasy. The Fleet’s In. On The Town. South Pacific. These had been my fantasies since childhood. and staring at sailors in the town as a very young girl. Absolutely blown away that night in the Spring of 1975.
and performing and singing the most wonderful, unique, catchy, original, quaint music ever. was in turn my own dreams made real when seeing them perform That music in Those uniforms. Couldn’t wait to buy the album. Took it to every party and all my close friends were immediately convinced of its brilliance. I encouraged them to join me when I discovered that Sailor would be performing at Chilworth Manor. They too had fallen in love with the iconic image on the front of the Sailor album. The white suits, the good-looking guys. We couldn’t wait to go. We arrived and spotted the band before the performance. We spoke with them and got their autographs. They seemed bemused that we were aware who they were. There was a fence in front of the stage. We were the first to create a front row. leaving bruises that we were proud of for the following week. Navy blue Sailor suits. Wow. Phil saying to Henry “They know all the words!” with surprise. 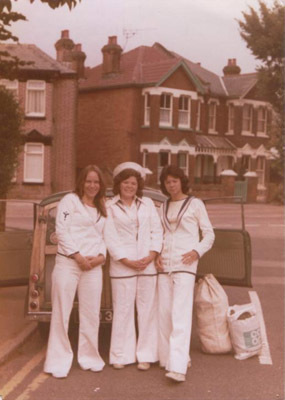 Quest to get hold of white Sailor suits. Trips to Military Surplus Stores in our home town and also in Salisbury. Wearing them with such pride. To anyone who enquired we were able to tell of our favourite band and their amazing music. We were a walking advert for the cause of Sailor. Nights in each other’s bedrooms playing Sailor again and again and again. and therefore mime the playing of his particular part in each song. Working so hard at weekends to afford enough money for Sailor concert tickets and train tickets. Actually excusing myself from work to rush home and watch two minutes of Supersonic. Planning, dreaming and talking about the next concert. Always, always, always. So in love. Never tiring of favourite songs. Drawing pictures, making tapes. Taping interviews from the radio. Buying various music papers endlessly even just for a print of the word ‘Sailor’. Absolutely adored every member of the band equally. I always wanted Georg. No question. Bittersweet, to recall it all now. We were young. It mattered so much. of our lives during those years of 1975, 1976 and 1977. Talking to Georg on the phone at a club in Derby. Receiving a letter from Grant. Visiting Grant’s home for the day. Meeting the band before the shows, during rehearsals and after the shows as well. for our train journey home and college the next morning. Making little felt Froggies dressed as Sailors with hats which said HMS Rolias. Souvenirs. Precious things still held as treasure to this day ... I have it all. Records, tapes, autographs, photographs, scrapbooks, tickets. Everything still. Not understanding why, during 1977, we heard so little of the band. Wanting desperately for things to continue in the same way. Going to see The Stranglers, Deaf School, Roogalator, Ian Dury endlessly. Another opportunity to wear the Sailor suits – Empire Ballroom, December 1977. By this time our group had swollen to about 8 wanting to go. Organizing the tickets and travel as usual. Always a pleasure. Fabulous show. Too difficult to stay and talk. Too late. Had already met future husband during the Autumn of 1977. Always one eye looking out and one ear listening out for more Sailor. Aware that Sailor had reformed. Totally UNABLE to accept any members other than the original four. Too much love invested. MY Sailor. Georg, Grant, Phil and Henry. No-one else. How can anyone else sing Georg’s songs? I won’t accept it. 29 years since seeing Sailor. Internet. James M. Emails. Biographies. Party. Ollie Marsh? Yes that seems okay. At last. It really seems okay. Woking. So, so glad we came. Sailor? As amazing as ever. To see Sailor, to see Georg. To speak to them all. To cherish the fact that they are all alive and well. For Georg to get up and sing an encore? Did it really happen? Something I had convinced myself would never happen again. Sweet Barbie. As proud as I felt. Emotions too, too difficult to write. could understand how special it all was for us with our memories from 1975. 29 years. If we meet again I could tell you so much of our love and thoughts for SAILOR.